Protests have entered their second week after 110 people died in Bangladesh’s worst ever clothing factory fire. 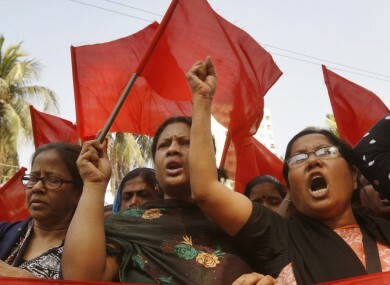 BANGLADESHI GARMENT WORKERS clashed with police today as some 10,000 protested over the deaths of 110 people in the country’s worst clothing factory fire, with demonstrations entering a second week. Industrial police deputy director Moktar Ali said a false rumour about another fire in a plant sparked the latest protests as workers gathered in the streets of Ashulia, a manufacturing hub of 500 plants outside the capital Dhaka. “There were around 10,000 workers. They barricaded a road at Ashulia and attacked some vehicles and factories,” Ali said. Police fired rubber bullets and tear gas to disperse the “unruly” protesters who fought back by hurling stones, he added, saying about 50 factories had shut fearing further attacks and vandalism. The fire at the Tazreen Fashion factory on 24 November in Ashulia led to 110 deaths, mostly women paid as little as 37 dollars a month who were unable to escape the blaze or who jumped from elevated windows. The factory was supplying clothes to a variety of international groups including US giant Walmart, Dutch retailer C&A, Hong Kong supplier Li & Fung as well as to the brand owned by US rapper Sean “Diddy” Combs. Activists and industry workers have staged demonstrations demanding better safety almost every day at Ashulia and in Dhaka since the tragedy. Email “Clashes with police as 10,000 workers join Bangladesh fire protest”. Feedback on “Clashes with police as 10,000 workers join Bangladesh fire protest”.